Born in 1837 in County Cork, Ireland, Mary Harris immigrated as a teenager to Canada and, later, to the United States. She found work as a schoolteacher and then as a dressmaker. During her time in Memphis, Tennessee, she married George Jones and gained the last name that became part of her legacy. After her husband and their four children were lost to yellow fever, Jones lost her dress shop to the Great Chicago Fire. The tragedy spurred her to political action. Jones joined the Knights of Labor, precursor to the Industrial Workers of the World, and began staging strikes and protests on behalf of laborers. 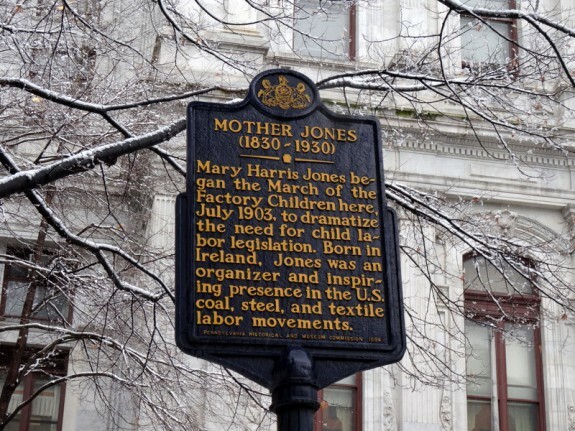 A devout Catholic, Jones believed good wages for working men would allow women to stay home with their children, who should be in school and not forced to work in factories. 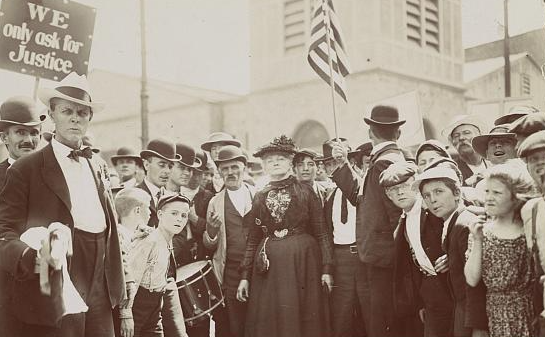 Jones is remembered for her fight against child labor, particularly the Children’s Crusade march of children who worked in mills and mines. 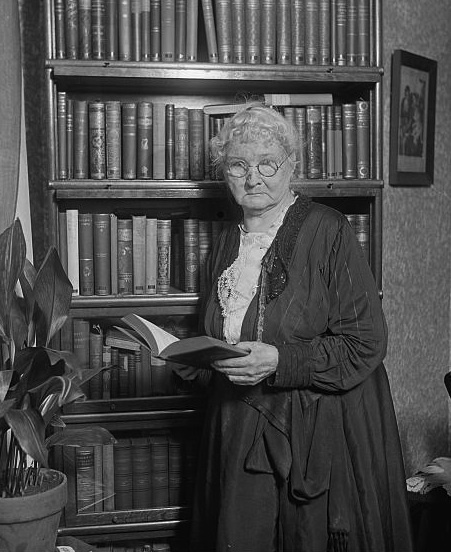 Though Jones was not able to arrange a meeting with President Theodore Roosevelt as part of the march, it brought attention to child labor conditions, and Roosevelt referred to “Mother” Jones as “the most dangerous woman in America.” Jones, shown here in her later years, died in 1930 at age 93 and was buried in a miners cemetery, alongside miners who were killed in strike-related violence. 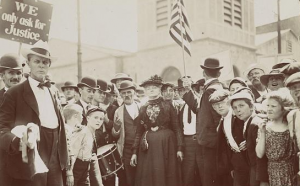 The March of the Mill Children, the three-week trek from Philadelphia to New York by striking child and adult textile workers launched on July 7, 1903, by Mary Harris “Mother” Jones (1837-1930), trained public attention on the scourge of child labor and energized efforts to end it by law. A fierce opponent of child labor and a masterly tactician, Jones seized on a march of young workers as a way of publicizing the strike while also exposing the evils of child labor and the excesses of industrial capitalism. Children were sent to work in coal mines and mills to supplement meager family incomes and as a result suffered stunted growth and maiming injuries. The 1900 census reported that one-sixth of American children under age 16 were employed, likely a gross undercount. More children worked in textile manufacturing than in any other trade. By 1900, textile factories and allied trades dominated Kensington, an early manufacturing center. At a rally in Kensington’s Labor Lyceum Hall (2914 N. Second Street), Jones revealed plans to lead an “industrial army” of hundreds of child strikers and their parents on a march of nearly 100 miles to New York City to dramatize their cause. She later expanded the itinerary to include a pilgrimage to President Theodore Roosevelt’s Long Island summer home to plead for child labor laws. The marchers left Kensington to the sound of fifes and drums, heading to Bristol and Morrisville in Pennsylvania. From there, dwindling in numbers, fed and sheltered by unionists, farmers, socialists, and other allies, the ragtag crusaders slogged through heat and rain into the manufacturing belt of New Jersey, soliciting donations and staging rallies often attended by thousands. Their route extended from Trenton, Princeton, and New Brunswick north to Elizabeth, Newark, and Paterson, then into Passaic and Jersey City. 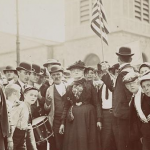 Reaching New York City on July 23, sixty marchers paraded up Second Avenue by torchlight. On Coney Island three days later, Jones put children in animal cages to dramatize what she labeled bosses’ attitudes toward workers. She and a delegation of five arrived July 29 at Roosevelt’s Sagamore Hill summer home, where they were rebuffed by his secretary. In the meantime, even before the crusade’s end, strikers thwarted by the manufacturers’ strategies and their own factional divisions had begun returning to the mills. Nevertheless, the march advanced efforts to abolish child labor. In 1904, the National Child Labor Committee formed for advocacy and action. A year later Pennsylvania toughened its child labor laws, though it took another thirty-three years, until the New Deal presidency of Franklin D. Roosevelt, for nationwide legislation protecting young workers, the Fair Labor Standards Act of 1938, to replace a patchwork of state laws. Gail Friedman holds a Master’s Degree in Public History from Temple University. She worked as a community planner for Bucks County, Pennsylvania, from 1999 to 2015. Cordery, Simon. Mother Jones: Raising Cain and Consciousness. Albuquerque: University of New Mexico Press, 2010. Currie, Stephen. We Have Marched Together. Minneapolis: Lerner Publications Company, 1997. Gorn, Elliott J. 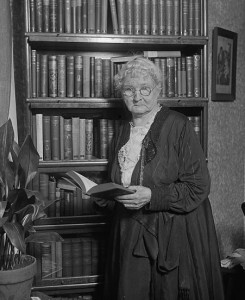 Mother Jones: The Most Dangerous Woman in America. New York: Hill and Wang, 2001. Jones, Mary Harris. The Autobiography of Mother Jones. Edited by Mary Field Parton. Chicago: Charles H. Kerr Publishing Company, 1996. McFarland, C. K. “Crusade for Child Laborers: ‘Mother’ Jones and the March of the Mill Children.” Pennsylvania History 38, no. 3 (July 1971): 283-296. Scranton, Philip. Figured Tapestry: Production, Markets and Power in Philadelphia Textiles, 1885-1941. Cambridge: Cambridge University Press, 1989. Smith, Russell E. “The March of the Mill Children.” Social Service Review 41, no. 3 (September 1967): 298-303. National Child Labor Committee Collection, Library of Congress, Washington, D.C. 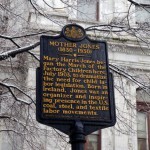 Mother Jones historical marker, N. Broad Street and John F. Kennedy Boulevard, Philadelphia. Plaque commemorating the centennial of the March of the Mill Children’s arrival in Princeton, Palmer Square, Princeton, N.J.
Sagamore Hill National Historic Site, Oyster Bay, Long Island, N.Y. Thanks for this article that I just read for the first time. I believe we are agreed that Mother Jones was one of the truly great leaders to live in this country. 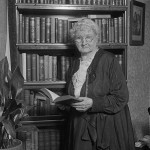 I wrote a biographical poem about her life that you can see by searching Mother Jones name on my blog. Thanks this helped a lot. This was really helpful. Wow, really liked this artcile. Helped me a lot with my history homwork! Lol, if I ever do it ;)!! Haha. But i actually read this and like I really liked it so awesome!